Good Saturday morning! I am heading out to the water later today with a student run organization called Her Campus. If you have noticed something different about my blog layout, there is a new widget on the right side. Her Campus has a blogger community that I recently joined! I write articles for the website and today we are having a social event. In other news, the picture above includes items that I recently bought over the week. I went to Michael's craft store with two lovely friends. I knew that the Ellen Tracy line was slowly being marked down, so I wanted to check it out! I love when designers collaborate with big name stores (H&M and Alexander Wang in November! & Altuzarra for Target September 14th!). 1. Initial "A" Notebook..monogramming is so popular right now. Everyone is putting their name somewhere. Even blogger Chiara Ferragni has a motorcycle jacket with her name on it! I love the personalized details that stores are releasing. This notebook was only $1.50, and it reminded my friend of the Great Gatsby theme with its prominent gold outlines. And if you download the app Retail Me Not, you get coupon codes to enter at the checkout. My other items were on sale so the 40% off coupon was applied to the journal, making it actually cost $0.90! 2. Ellen Tracy lip-gloss..the shimmery pink lip-gloss is the first one in this set that caught my eye. The three colors are great for when you want a light shine, a medium shine, and a bold red lip. The red in this set is insanely pigmented and dries really fast (not to be confused with drying out, it just dries so you really don't need to blot!). For a crazy price of $0.80...these lip-glosses are such a steal! They are portable and fit in most bags! 3. Ellen Tracy pens..stationary is so fun while you are in college. Sending letters has become something I enjoy doing on my down time. I love finding cool cards to mail and using these pens will make it even more exciting. Not sure if I'm the only one, but when I find pens that write really smoothly its a good feeling. These are multicolored and have cool red and blue patterns. Again at only $0.80, I could not pass up this deal! 4. H&M adjustable charms necklace..okay, so I didn't buy this but my Mom sent it to me and I am too excited not to write about it! (Thanks Mom!) This necklace is no longer available online because it sold out, but I think you will have better luck in the stores! The gold chain comes with one of every letter in the alphabet and you can put whatever combination you want onto the chain. 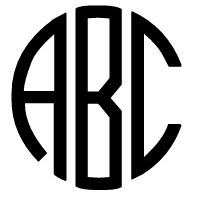 Right now I have my initials "ACB" on it! The going price is $7.95 for in-stores, and online it was going for $4.95. Have a great weekend. Follow me on social media for quotes and pictures about my life!